If you need a basic template to store, view, and share your recipe collection, don’t overlook Yum 3.0.7 . It not only catalogs and displays your recipes with admirable simplicity, it allows you to format, import, export, e-mail, and print them, scale them to any number of guests (where appropriate), and store them on your iPod. Though it lacks flashy, automatic features like autofill (which flows Web-based recipes into programs by simply importing a URL) and network sharing, and lets you import and export only a limited number of file formats, Yum does make it easy to cut and paste your favorite recipes and their images into its ingredients and directions sections. While some parts of the program, such as the customized layouts, have a 1990s database look and feel, if you can live with that you’ll find Yum to be a very capable recipe program. Yum opens in a single window with three adjustable columns that display navigation and information. The leftmost column lists overall meal categories, and the next column lists individual recipes within each category, displayed when you click on the category. The main window holds the entire recipe, ingredients, directions, and picture (if one exists). You can switch between the view and edit modes to modify a recipe. You can remove recipes and categories, move recipes to your iPod, and use a slider to adjust the line breaks to tweak the way the recipe looks on screen or in print. A retractable Category drawer expands and contracts with a button command from the toolbar, though it’s something of a historical appendage that’s not really needed, as there’s already a main Category column. A handy Shopping menu command lets you create a shopping list from any recipe or combination of recipes, and you can check off the ingredients that you already have. Yum comes with a choice of six layouts. The Layout pane lets you adjust the format of any recipe you want to view, edit, or print with convenient pull-down menus, and you can specify different layouts for on-screen viewing and printing. And, once you’re ready to start cooking, you can view the preparation steps full screen. You can change the typeface and colors of the different components of your recipes to customize the presentation and make it more pleasing. Yum even lets you create custom layouts, but the look and feel of this feature is not especially friendly, and it took a few tries to get the layout and colors to display exactly the way I envisioned them. Moreover, some references in the layout choices can be confusing, such as the layout called NIXANZ (which is actually a tribute to the original Yum developer). 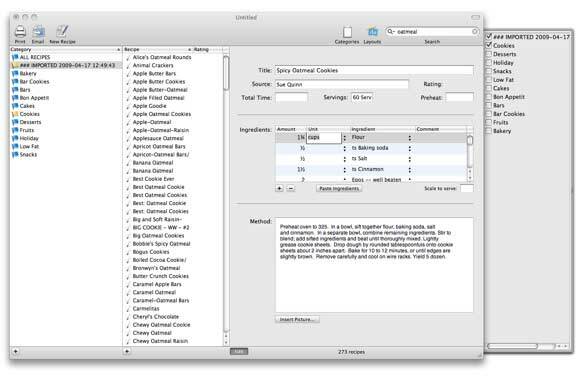 Yum has a clean and simple interface that lets you import recipes in MasterCook, XML, or text formats. The program has some unexpected and nontraditional menu items. 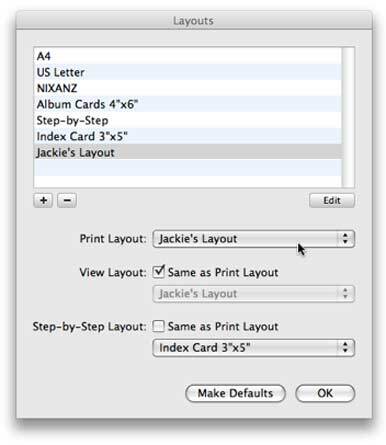 For example, to print, most Mac users would look under the File menu. And indeed, under the File menu you’ll find printing functions-but for all the recipes, not just the one selected. To print or e-mail a single recipe, you have to look under the Recipe menu. That said, a new Help system, introduced with this version, is much more complete and helpful than the previous version. Yum comes with several layout templates, but you can create your own layouts. Yum 3.0.7 is a solid, no-frills recipe manager priced fairly reasonably at $20. However, considering that it has no autofill function, no shared networking function, some odd menu item placements, and isn’t always smart about importing files, you may want to seek a more elegant program in the same price range. Still, I give Yum credit for directly importing MasterCook files, as there are a lot of those out there, and giving you lots of flexibility in styling and printing your recipes. If you’re looking for a simple and flexible app that can import some of the older-style recipes and let you share them via print or e-mail, Yum might just be the ticket.